0October 18, 2011Sean Saves the Coast Guard… wait, what? 0September 20, 2010Success Story: Vacuum Dehydrator Rescues a Paper Machine! 0July 19, 2010POLL: Are you CONSISTENTLY hitting your target ISO cleanliness codes on your critical equipment? Enter your email address and click below to follow our blog and receive notifications of our new posts by email. How would you like a printable industrial quick-reference? Click here to subscribe to our official newsletter. Compliments of our tech crew, we'll send you FREE conversion tables, ANSI flange dimensions, formula cheat sheets, and more in PDF format like the ones shown below. In addition to the quick-reference guides shown above, you'll also receive some great technical tips and success stories from our filtration adventures. Click here to sign up now for our filtration newsletter receive these great resources today. Are you on Facebook? So are we. "I know you don't hear from us much as I would like to but that might actually be a GREAT thing. Everything is working exactly as expected. The upfront R&D that we worked through with the help from you and your team has absolutely paid off for us. 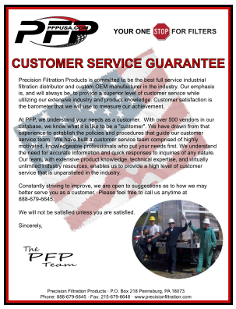 As always we appreciate everything that PFP does to help us along the way." 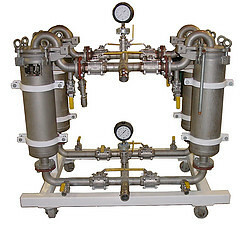 How did installing a Duplex Filter System save a customer time and money? 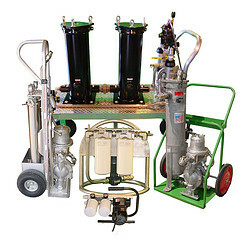 Precision Filtration Products (PFP) is a distributor and manufacturer of all types of industrial and commercial filtration products. We offer substantial savings and “one-stop shopping” for ALL filters and filtration systems. 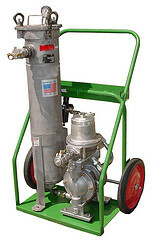 PRODUCTS include (but are not limited to): Air Filters, Aviation, Bag Housings, Biodiesel, Blowers, Cartridge Housings, Cartridges, Chemicals, Coalescers, Compressed Air, Compressors, Custom OEM, Diesel, Discs, Dust Collectors, Electronics, Elements, Fasteners, Filter Carts, Fuel, Gas, Gasoline, HEPA, High-Flow Pressure Vessels, High-Velocity Flushing Skids, HVAC, Hydraulics, Hydrocarbon, Industrial, Liquid, Lubrication, Natural Gas, Oil, Oil Mist Eliminators, Packaging, Petrochemicals, Pharmaceutical, Pigging, Pipelines, Plastics, Plating, Portable Systems, Power Generation, Printing, Process Streams, Pulp and Paper, Refining, Separators, Surge and Pulsation Control, Synthetics, Transit, Vacuum Dehydrators, Vacuum Pumps, Waste, Water, Wire Mesh.